We followed the circumstances of their shooting, explore the medical practices of that era, and analyze the medical advances or lack thereof, over the decades that intervened between the assassinations. Herb Kaufman has been a life-long student of the Civil War era. He is a founding member of the faculty of the Civil War Institute at Manor College, and has taught life long learning courses on a wide variety of Civil War topics at a number of local universities and community groups. He is a well known speaker on a variety of topics relating to the era of the Civil War having presented programs to civic and community groups, and educational and historical associations throughout the Philadelphia area. He is currently a member of the Editorial Staff of the Civil War News, writing both news and feature articles. He also been a Civil War reenactor, and has received numerous awards for his continuing work in education and support of the history of the Civil War. 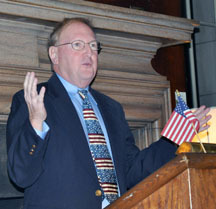 He presented programs for students and adults at the Civil War Museum of Philadelphia, and is a member of the Board of Directors of the GAR Civil War Museum and Library of Philadelphia. He is currently the treasurer of both the Delaware Valley and Old Baldy Civil War Roundtables, and is a member of numerous historical and community organizations. Mr. Kaufman possesses a Bachelor’s and Master’s Degree in Education from Temple University. This entry was posted in Meeting archive on November 10, 2014 by hlj.